Thanks to a new program, the Class of 2021 received gifts from the heart. 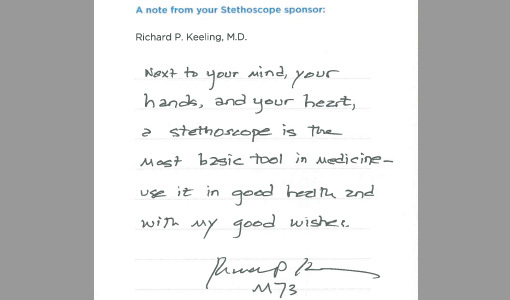 It’s one of the most enduring symbols of modern medicine: the stethoscope. 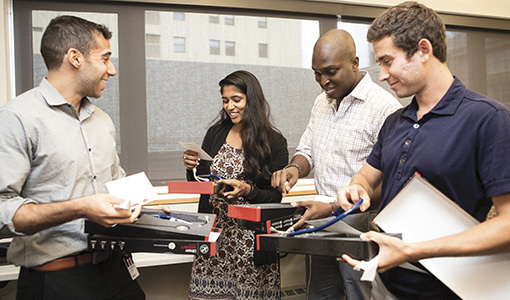 Thanks to the School of Medicine’s new Stethoscopes for Students program, alumni, parents, and friends donated $31,165 to provide the Class of 2021 with their timeless instruments.“ It’s one of the major tools that physically connects patients to a doctor,” said Amy Kuhlik, dean for student affairs at the medical school. 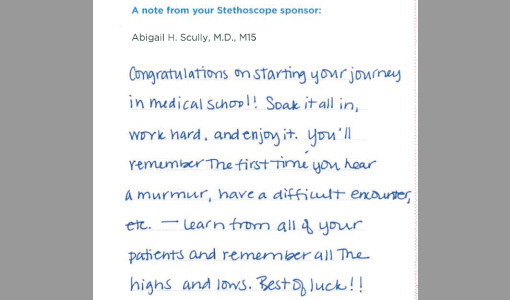 “Receiving one’s first stethoscope is a rite of passage that all doctors seem to remember and cherish,” added Kristin Hill, director of the Fund for Tufts Medicine who oversaw the initiative. 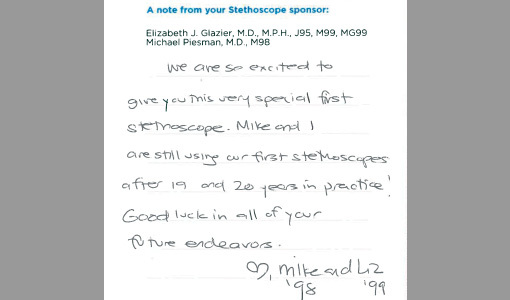 When students opened their stethoscopes at orientation in August, they were touched to find personal notes from the donors in the boxes. Some included jokes (“I hope they don’t ask me to show the student how to use it. 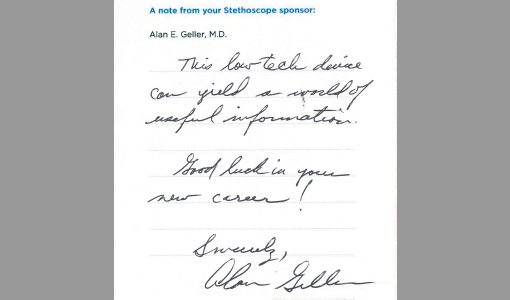 I’m a urologist.”), others were short and sweet (“Happy heartbeats! !”), and all were, well, heartfelt. 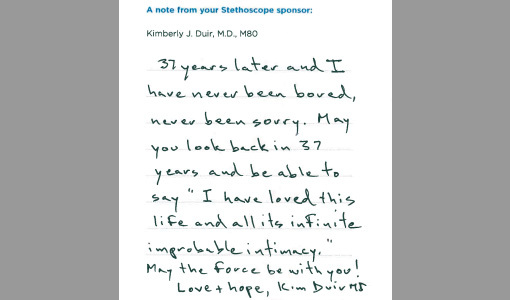 In the slideshow above, check out a few of the handwritten messages that accompanied the stethoscopes. Celebrating just some of the discoveries, pioneers, and innovations at the heart of our school. How Dr. H. Jack Geiger and Tufts created the country’s first community health centers—and launched a movement. Robert S. Schwartz figured out how to prevent organ rejection. Tufts researchers find an underlying neurological mechanism for mediating fear response. 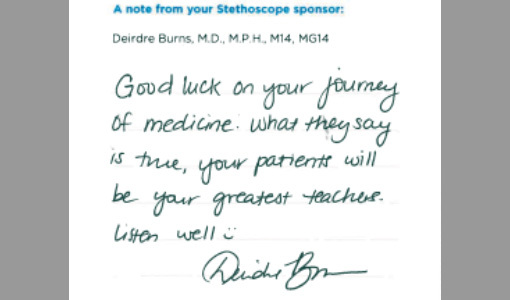 One of the first Maine Track graduates shares why she’s committed to rural care. New Sackler School dean Daniel Jay strives to train graduates for a range of biomedical careers. A Bingham Trust grant will boost the Tufts-designed STEM curriculum.